THE SOCIAL RESULTS OF THE NEW EDUCATION. Introduction of Manual Training Has Influenced Us to Respect Those that Work with Their Hands. 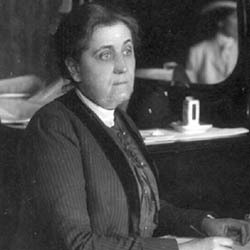 At the Benjamin Harrison school, yesterday afternoon, an audience of 800, chiefly teachers of the city schools, heard with rapt attention the address of Miss Jane Addams, of the famous Hull House settlement, at Chicago, on "Social Results of the New Education." The keynote of her address was that [the duty] of the community did not end with the education of the child in the school, but that this education should, in [a?] measure, be extended to the parents, and that protection from the wearing out processes of the factory should be given to the children even after they have reached adult age. The old definition of education, she said, was that it was a preparation for life. The new definition was that education was a permanent thing in life from the time the mind first wakes up until it is closed in death. "We have had," she said, "a great discussion in Chicago in regard to the evils of child labor and the uses of child labor legislation. We are trying to get some amendments to our child labor laws. Among the opponents are those who think that parents know best what is good for the child, and that the community has [no] business to interfere with the child. Then there are employers of child labor [in?] factories who are in opposition to these amendments. "If a community has expended a certain amount in the education of a child, that community certainly has a right to say something about the things that shall happen to that child afterward. 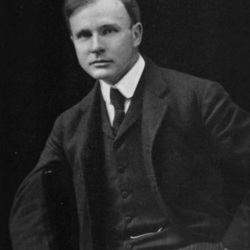 "The community is willing to educate and train children up to the age of fourteen to be used in industries, but it must [not] give them into the hands of manufacturers, to be used up in ten or fifteen years and then thrown back upon our hands as a care, to be sent to the poorhouse." "Let us, as a community, see to this. 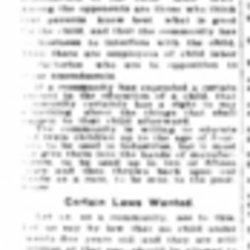 Let us say by law that no child under twenty-five years old -- and they are still children at that age -- should be allowed to work in certain processes of India rubber more than four hours out of twenty-four. There are such rules in Germany concerning certain occupations, and, also, though not to as great an extent, in England. In the United States there is no restriction as to hours, and they may work ten to eleven hours a day. "There is no rule here as to night work. What happens to the boy of fourteen put into certain types of factory work? He stands it for a few years, breaks down, and by the time he is old enough to expect his share of life he has no longer the grip he had five or ten years before. Let us see to it that these lives shall not be wasted before they have had a chance to lead the useful life for which educational processes are supposed to have fitted them." She spoke with approval of the introduction of manual training into the public school system, and was strong in the belief that this influenced us to respect those who worked with their hands. Speaking of the Dewey school of Chicago, a school of industrial development, she said that the whole attitude of the children of that school had changed toward the people who work with their hands, and the boys and girls had the spirit of comradeship for those who earned their living in trades. She spoke of the art feeling that is being built up in this country, of persons going abroad to see things that may be learned in their own communities of foreigners who have the artistic instinct in many things as a heredity. In this connection she spoke of women in the Hull House neighborhood of eight different nationalities, Italian, Swiss, Swedish, Norwegian, [Romanian], Russian, Syrian and Polish, who spun and wove beautiful things with the simple implements of their native land. To give notice to the [talent] that these women possessed was [to raise?] them in the estimation of their [children]. She spoke of this love of art that was frequently expressed by the poorest [illegible words] of an Italian who carved the door [and] windows of his humble dwelling place [and] was turned out therefor by the [landlord] of another who made a beautiful [hanging?] decoration out of plaster of Paris [page 2] for his room and narrowly escaped a like fate. There are others who can do handsome inlaid work whose talent is unrecognized and who earn their living as fruit sellers or as railroad laborers. "I am not," said Miss Addams, answering a question asked by Superintendent Kendall, "so terribly afraid of the street as many persons are. You have different conditions here from those we have in Chicago. You have no slums, I am told. I am touched with the care that our teamsters show for the children who play in our streets. It is seldom that one us hurt. But in the street they are constantly interrupted in their play and play to be helpful should be continuous." Few Arrangements for Child Life. "If anyone should drop into our cities from Mars his first wonder would be whether we had any children, as so few arrangements are made for the life of the child. Every child should have some outlet for its restless muscles. "I think it is a great pity to separate the child from the parents as much as we do in the schools. There is no need for so much of it. 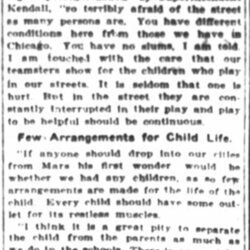 In Hull House we try to keep near to the parents." Superintendent Kendall announced that Bliss Perry, editor of the Atlantic Monthly, would address the teachers at the Harrison school on January 29, and that there would probably be another lecture before that time. 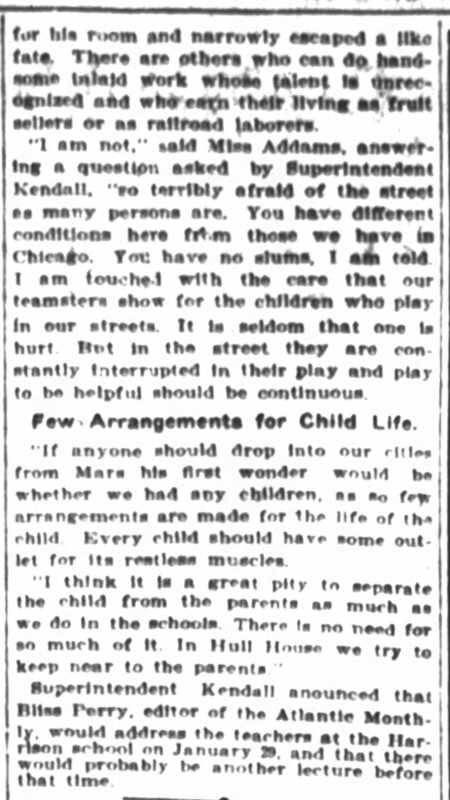 Teachers Addressed by Miss Addams, Indianapolis News, December 19, 1902, p. 7. 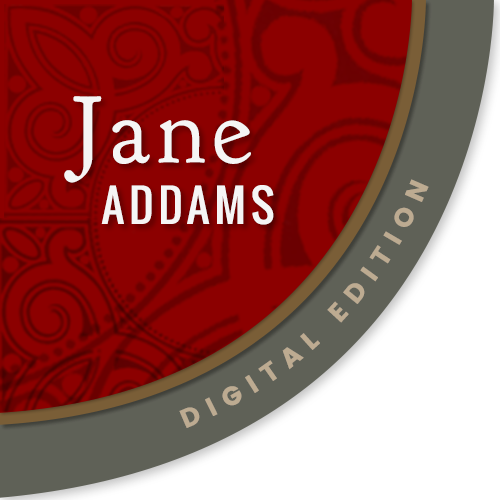 Addams, Jane, “Social Results of the New Education, December 18, 1902 (excerpts),” Jane Addams Digital Edition, accessed April 22, 2019, https://digital.janeaddams.ramapo.edu/items/show/16943.